Chasing kidnappers involved in a Nazi plot to change the world leads a pilot with his own charter service on an adventure that stretches across the Hawaiian Islands. This new novel released by Dog Ear Publication features a missing scientist and his beautiful daughter, set against the backdrop of the 1940s. 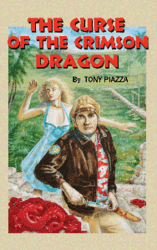 Dog Ear Publishing releases “The Curse of the Crimson Dragon” by Tony Piazza. (The book) follows Ryan’s adventures across three islands, facing danger and death. Gifted pilot Ryan lives in a Hawaiian paradise, running his own charter service and occasionally helping the Honolulu Police Department. His idyllic world changes when government agents ask the former Air Force captain to help look for a Nobel Prize-winning fission scientist who’s gone missing in this new novel set in the 1940s. The agents think members of the Third Reich are behind the scientist’s disappearance and want Ryan to use his extensive knowledge of the islands to learn what happened. “The Curse of the Crimson Dragon” follows Ryan’s adventures across three islands, facing danger and death while racing against a devastating discovery that could change the entire world. The author uses extensive historical research to bring the mood of the wartime generation to life in chilling detail. Smuggling, murder and intrigue create twists and turns in this suspenseful tale that also offers an element of romance. Author Tony Piazza has done many things in his life, including working in the film industry for 10 years as an actor, extra and stand-in, meeting legends like Paul Newman, Clint Eastwood and Steve McQueen. He performed scientific research at the University of the Pacific, University of California San Francisco and for San Francisco’s Veterans Administration Hospital after earning a biology degree. This is his second book for the Sisters in Crime member. Piazza also wrote the mystery “Anything Short of Murder,” an homage to 1930s Hollywood. For additional information, please visit http://www.curseofcrimsondragon.com.